With a really compact design, Celestron Advanced VX 6 Newtonian Telescope is one of the best intermediate to professional telescopes currently available on the market. Stable, and relatively portable, this scope is also an excellent entry-level piece (because of how user friendly it is), suitable for indoor and outdoor observation. This telescope guarantees some of the best crisp images you can obtain with a 6-inch scope. Celestial bodies such as the Moon, Saturn, Jupiter, stars and nebulas, are waiting to be explored, and Celestron Advanced VX6Newtonian is just the best tool to do it. We rarely go forward in enthusiasm and express full support to a scope, but if we should pick just one telescope that has gotten out full attention, the Celestron Advanced VX 6 Newtonian Telescope would definitely be it. What is the Celestron Advanced VX 6 Newtonian Telescope? The Celestron Advanced VX 6 Newtonian Telescope is a 6-inch Celestron optics piece of astronomic equipment, meaning that on this scope you will find the high quality Celestron-made pieces that we all know and love so much. With a compact design and a quite wide aperture, this scope will give you some excellent clear crisp images of your favorite celestial bodies. The amazing mount is the only feature that separates this scope from another 6-inch Newtonian Celestron telescopes. An incredible sturdy mount, the Advanced VX Mount, can hold up to 30lbs of weight, without any problem whatsoever. The mount is stable on all types of terrains, allowing you to leave behind all the shaky images of other mounts and tripods. Due to the Periodic Error Correction, this mount will constantly eliminate any track errors that usually appear during observation. This feature combined with new technology and with high-quality motors with enhanced speed and power will prevent all errors and losses of balance. A rather common problem that is noticeable in the case of other models of mounts, the inference between the motor’s housing and the meridian, was finally solved by Celestron’s designers, allowing the mount to do 180° to 360° rotations to reach the desired target. You won’t be experiencing the typical mounting problems in the case of the Celestron Advanced VX 6 Newtonian Telescope, and that’s a strong pro for this optical tool, in our opinion. The mount comes with Celestron’s NexStar technology, meaning that all optical tube mounted on this Advances VX Mount will have the All-Star, innovative polar alignment procedure. You can use the hand control align your scope based on any three celestial bodies, or to select the object that you want to explore. From an optical point of view, the scope comes with a 20mm fully coated eyepiece that offers a 38x magnification. In time, you will have to purchase some additional eyepieces, but for a beginner astronomer even this only eyepiece is quite good. To minimize all spherical aberration that usually destroy the perfect image of different celestial objects, the Celestron Advanced VX 6 Newtonian Telescope comes with a parabolic primary mirror that manages to reduce all type of optical inference. Purchasing a collimation tool is more than necessary in the case of the Celestron Advanced VX 6 Newtonian Telescope. Newtonian telescopes, as well as other types of telescopes, need collimation once in a while, and sometimes, doing the collimation can be quite a hassle. With Celestron’s collimation piece, this procedure has never been so easy, so you may think of purchasing it, as this piece is not in the standard pack. Tripod – the telescope’s metal tripod is one of the steadiest tripods we’ve seen in a while. 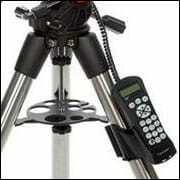 Very resistant and quite heavy, this tripod will give you maximum stability. To have even more stability, you can always purchase a counterweight that will make your tripod steady as a rock. Easy to mount and to use – mounting this scope is quite easy and can be done with little to none tools, by anyone in just a matter of minutes. Excellent optics – remarkable eyepiece and a great mirror, this scope comes with some excellent optics. The only minus would be the number of eyepieces. Having only one, you will have to purchase at least one or two other eyepieces. Great software – even if this scope is not really a computerized telescope, it still comes with a great tracking software, installed on the mount. You can easily locate your celestial bodies, or even align your scope due to this software. Battery eater – this scope needs a lot of power and this is a huge con, if, for example, your observation point is on the top of a hill where you cannot park. You will always need a power source while using this scope, so we recommend purchasing a PowerTank, as it will really make your life easier. Where to Find the Celestron Advanced VX 6 Newtonian? The standard price on Amazon is somewhere between $1000 and $1500, FREE shipping included. 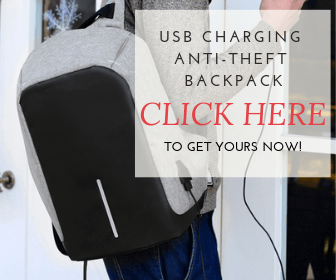 Amazon usually comes with some amazing prices, offers or even up to 40% reductions, so you may want to keep an eye on them. When it comes telescopes, we would insist to try to purchase your product from a trustworthy place, be that a shop or a website. Telescopes are fragile pieces, with lots of optical pieces and also with small, but useful items than can be easily harmed or lost. Try to buy your scope from a place that offers a good warranty, as well as all the pieces that should be in the pack. Celestron Advanced VX 6 Newtonian Telescope is not a cheap department store telescope, so you may want to be very careful where you’re taking it from. The Celestron Advanced VX 6 Newtonian Telescope is a typical Newtonian scope, so regular maintenance is quite common and expected. You won’t have to do nothing special when it comes to cleaning this telescope, just the usual procedure of any type of scope. The optics are a key feature of any scope, so you must take extra care of them. Try to clean them as rare as possible, especially the mirror. Apply dust covers after all the observation sessions to minimize the risk of contamination, remove the dust with a specialized brush (made of camel’s hair) or with pressurized air. No industrial cleaning solutions should be used for a scope. Use only lint-free cloth and remember to clean your piece from the center to the outer regions of your piece. Do not rub in circles and do not use normal paper towels, as these will destroy your optical pieces. 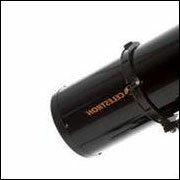 Collimation is necessary for the Celestron Advanced VX 6 Newtonian Telescope. You will find all the necessary info in the scope’s manual, or even online. Start with the manual, and if the explanations are not conclusive, look on the internet. When purchasing the Celestron Advanced VX 6 Newtonian Telescope, it will come with a bunch of very useful accessories. First of all, you will receive a 20mm with a 38x magnification. Then, the scope comes with a very steady tripod that has a, accessory tray where you can put all your eyepieces or any other accessories. The scope will also come with a NexStar+ Hand Control, a handled control unit, which will allow a better alignment of the scope, as well as plenty of information about some thousands of celestial bodies, that can be immediately located due to this remote control. 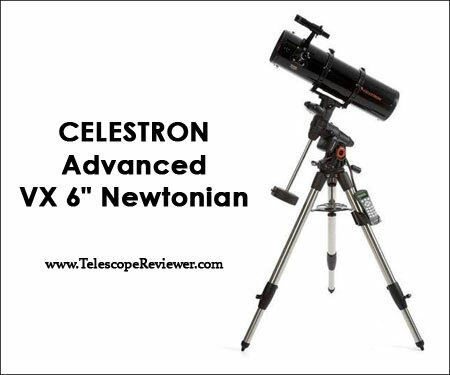 Celestron Advanced VX 6 Newtonian Telescope carries a two years warranty. For any technical problems, call Celestron’s support department. If the product ceases to work, do not try to undergo any type of reparation, as this may result in the loss of the warranty. Warranty doesn’t cover products that have been modified, abused in all manner, mishandled or had unauthorized repairs. 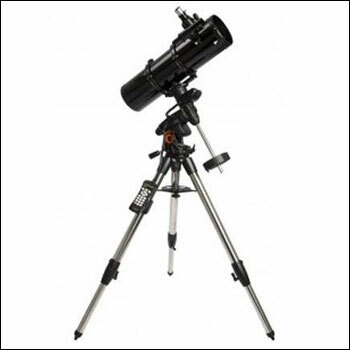 For more details and information on this model, check out Celestron’s website. The Celestron Advanced VX 6 Newtonian Telescope is an incredible convertible piece, and an amazing asset for all telescope enthusiasts (even friendly to beginners due to its simple use, in spite of the quite advanced level of optics which makes it a better fit to the pros). 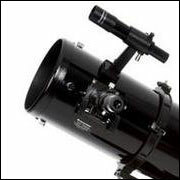 Due to the mount and the NexStar Hand Control, this scope has similar features as a computerized telescope. The software offers valuable information about some of the most important stars and planets, making this scope an incredible resource for all beginner astronomer who wants to learn more and more on the outer space. Great optical components, an excellent mount, and a price that is more than acceptable for this quality. Light and rather affordable, this scope is a great asset for a passionate astronomer who want to get to the next level of knowledge. The Celestron Advanced VX 6 Newtonian Telescope is really one of those one-in-a-lifetime pieces that can make you go from no to pro in a really short time.